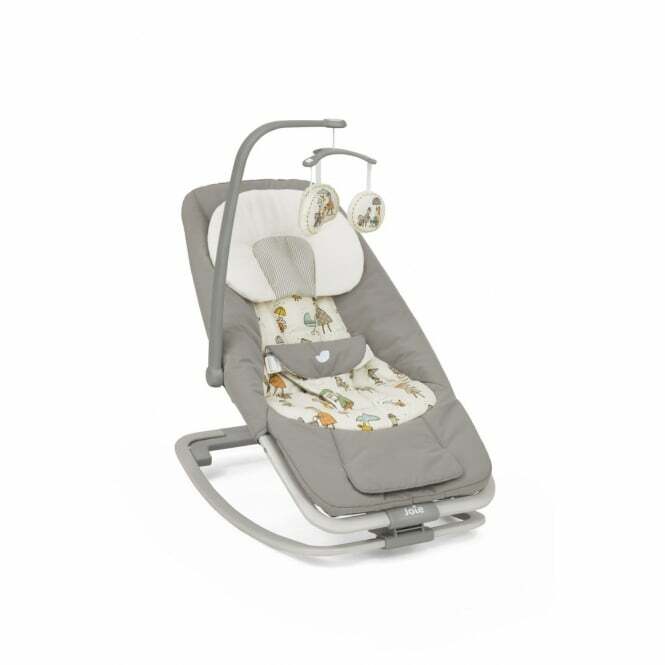 Joie Dreamer Rocker is an ideal baby bouncer for comforting your little one from newborn onwards, featuring a compact frame with handy extras which makes for a perfect nursery accessory for at home or on the go travelling! Why should I choose the Joie Dreamer Rocker? The Joie Dreamer Rocker is a cosy cradle which soothes your little one from a tiny pea all the way up to 13kg. It features a compact frame as well as handy extras which makes it an ideal solution for soothing your bubba at home or on the go! This bouncer is a perfect nursery accessory for travelling. With a lightweight design and an ultra slim compact fold, it makes moving around an absolute breeze! Just slot it in your boot and away you go. Additionally, this bouncer features a 3-position reclining seat which rocks or bounces with a simple push. Or, baby can jiggle around themselves and it will produce a soothing motion! Plus, if baby is struggling to settle down, this bouncer features 5 classical lullabies and 5 nature sounds. These sounds pair with a 2-speed soothing vibration and toys to calm your little one. If bubba's legs get a bit fidgety, then fear not. The Joie Dreamer Rocker includes a 2 position adjustable leg rest which offers ultimate comfort. If baby gets bored of the rocking, simply flip down the rock-stop foot and you can convert this bouncer into a stationary seat! Whilst stationary, your little trinket can play with the removable, rotating toy bar with 3 toys. Plus, you can easily access baby due to the open top design- Just in case you want a little cuddle! Once you're done, strap bubba into the SoftTouch 3-point harness with a soft lower buckle cover for ultimate safety. You don't even need to worry if you have any inevitable spillages! The plush infant body support and seat pad are removable and washable, and perfectly cocoon your baby. The Joie Dreamer Rocker has been tested beyond the standard weight capacity to hold up to 13kg. What are the specifications for the Joie Dreamer Rocker? Is there a Manufacturer's Warranty included with the Joie Dreamer Rocker? Joie offer a 1 year Manufacturer's Warranty from the initial date of purchase. Applies to UK mainland only.